2013 'Music Avenue' - 36:18/10 - Digipak. Jimme Vaughan's son. Jimmie is the legendary co-founder and original lead guitar player of the Fabulous Thunderbirds. 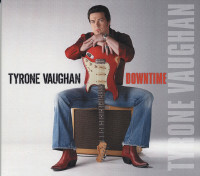 Tyrone has been a mainstay of Austin's still vivid music scene for many years. He has played with his own bands, and his late uncle's rhythm section, Double Trouble. A Belgian record label now has release his first album, a mix of blues, rock, and country sounds, a tasteful recipe made popular during the 1980s by singer/songwriters like the great John Hiatt, or Steve Earle. Tyrone Vaughan - voc/gtr, Don Reed - fiddle, Bob Lucier - pedal steel, Shane Ludgate - drums, Mike Churchill - drums, Stephen J. Boudreau - gtr/pedal steel/lap steel/dobro/banjo/mandolin/perc/kbds/hca/voc, Stephen Young - voc (on 1 track).